Dynamic Investment Theory sets the logic and rule-set for the creation of an innovative investment type called NAOI Dynamic Investments (DIs). They are capable of automatically changing the equities (either ETFs or Mutual Funds) they hold based on a periodic sampling of market trends. On this page I show how DIs work and the level of performance they can produce. Review Period – This is how often the DEP will be “ranked” to find the ETF in it that is trending up most strongly in price – “quarterly” is an example. The top ranked ETF is purchased (or retained if already owned) and held until the next Review event (i.e. for one Period). Trend Indicator – This is the indicator that is used to rank the ETFs in the DEP at a Review event. The NAOI has found a simple indicator that works exceptionally well. It will be shared with organizations that work with the NAOI. DIs are active investments that are passively managed. Investors simply buy and hold them while the DI’s internal intelligence signals trades, at predefined, periodic intervals, based on objective observations of market data and not on subjective human judgments that inject a major risk element into the investing process. The following series of charts and a table illustrate how Dynamic Investments work and how they performed during the volatile market period from the start of 2007 to August of 2014 during our testing period. The first chart, below, shows the value growth of a total market Stock ETF and a total market Bond ETF during the test period. Just below the chart is a bar that shows which of these two assets a simple Dynamic Investment with both the Stock and Bond ETF in its Dynamic Equity Pool (DEP). This is the simplest DI possible that only rotates between Stocks and Bonds based on the price trends of each. Keep in mind that all DI trade signals were generated automatically by the DI based on a periodic observation of market trend data; no human subjective decisions were involved. Vertical lines show where the DI changed the ETF it was holding based on the price movements of the stock and bond indexes being tracked. You can see that the NAOI designed DI was able to automatically detect uptrends in both Stocks and Bonds and change the ETF it held to take advantage of them while avoiding the losses of downtrends. DIs are market-sensitive while MPT portfolios are not and the difference in performance is astounding as discussed next. 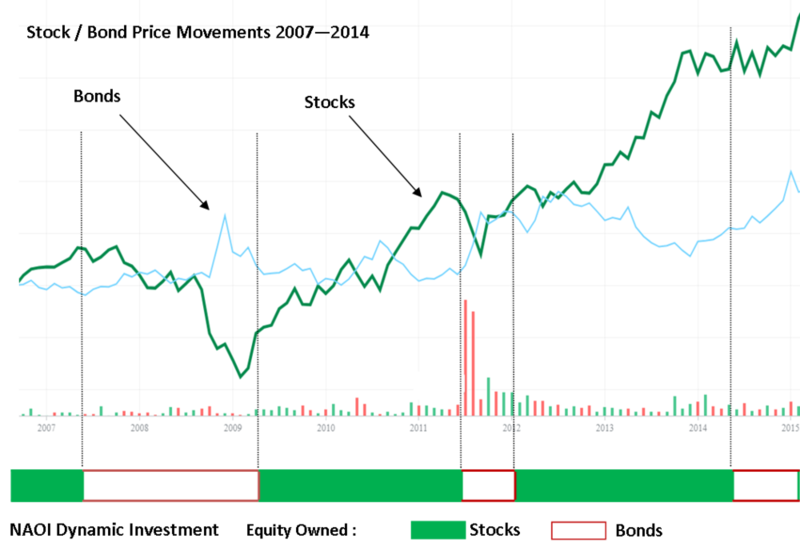 The green line on the chart below shows how this simple DI’s value grew during this time period as it switched its holdings between stocks and bonds as illustrated above. The lower, blue line on this chart shows the growth of an MPT portfolio holding the same stock and bond ETFs at all times with an allocation of 60% stock and 40% bonds. Using the above illustrated methods DIs are capable of performance that MPT portfolios can’t touch. To show the difference let’s look at the performance of the NAOI Core DI in comparison with a 60/40 MPT portfolio for the period from 2008-2017 using the same ETFs; one that tracks Stocks and one that tracks Bonds. The table below shows annual returns for each investment type during the period along with their Average / Year Return and the Sharpe Ratio. The Sharpe Ratio measures the amount of risk received for each unit of risk taken, the higher the better. And any value greater than 1.0 indicates a superior investment. You can see that the Dynamic Investment produced almost three times the returns of the MPT portfolio with far less risk as indicated by the Sharpe Ratio. Time-Diversity - This is a new portfolio diversity element that does not exist in the MPT world. Time-diversity arises from the fact that DI's automatically signal changes to their holdings over time based on a periodic sampling of market trends. And time-diversity is unique in that it not only reduces risk but also enhances returns. Time-diversity is a major reason that DIs produce far higher returns than static MPT portfolios. Objective Trade Decisions - A major problem in the way we invest today is the far too many trade decisions are based on subjective human judgments, a fact that opens the doors to all manner of risk elements including fear, greed, bad data, flawed analysis, sales bias and even scams. Dynamic Investments eliminate this risk by basing trade decisions based on objective observations of equity trends, a signal that has proven predictive power. This fact enables DIs to produce higher returns with greatly reduced risk. Higher Returns without Higher Risk - MPT says that higher returns can only be achieved by assuming higher risk. If this isn't true the entire MPT theory crumbles. DIT shows that it isn't true as illustrated in the returns table just above that shows that a simple DI during the test period not only produced higher returns than an MPT portfolio using the same ETFs, but it do so with a higher Sharpe Ratio. When the risk-return link is severed, the world of investing changes at a fundamental level. Ending the Active-Passive Management Debate - The investing world today is roiled by a debate over whether active or passive fund management is a superior approach. Dynamic Investments render the debate moot as they are active investments that are passively managed. DIs operate using the best elements of each approach in this one investment type. These are just a few of the startling major investing concepts made possible by DIT and the use of DIs. There are more. A word of caution is appropriate here. It would be a mistake to pigeon-hole the approach you have read about on this page as “momentum investing” - an approach that has been used many times in the past in multiple forms and with varying degrees of success. Dynamic Investment Theory and the use of NAOI Dynamic Investments are better described as "trend-sensitive" investing - an approach that simply takes advantage of the proven predictive powers of equity price trends in an intelligent and controlled manner. And while momentum-based investments are designed to operate within an MPT environment, Dynamic Investment Theory seeks to replace MPT with a new and more effective investing environment. In other words, do not dismiss DIT quickly because it seems to have some of the same elements of momentum investing. It is a different approach altogether as you will learn by reading on.